Labcon designs and manufactures Earth Friendly® disposable products for transporting and managing liquids in a laboratory setting. Labcon products include pipet tips (specialized droppers that attach to lab equipment), well plates (flat squares of material with depressions, or wells, for collecting liquid), and tubes (for culture and centrifuge work), as well as storage trays. Moving to Petaluma has enabled us to completely remake our company. With $33 million in annual sales, Labcon supplies 800 product lines to labs in 56 countries. Its 127,000 sq. 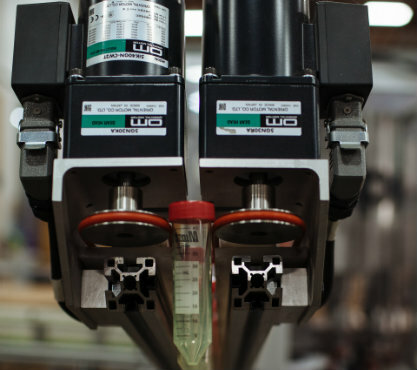 foot facility is equipped with 65 injection machines that mold 3 million pipet tips and about 2 million centrifuge tubes a day. Nearly 95 percent of Labcon products are made from easily recyclable polypropylene (#5) plastic or from compostable bioplastics made from plants. The company uses a 2,700+-panel solar array installed on the roof of its building to produce 30 percent of its annual energy requirements. Labcon relocated to Petaluma in 2003, spurred both by a redevelopment project on its original Marin County headquarters and a desire to locate closer to its mostly Sonoma County-based employees. The company has flourished here—increasing production, designing new products, and adopting sustainability measures to dramatically reduce the company’s environmental impact. 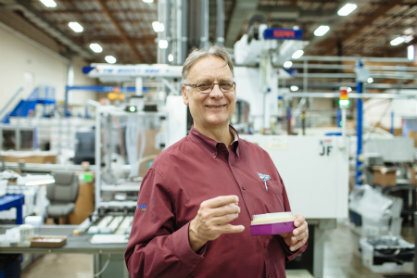 Petaluma has benefited, too: Labcon not only lends its support to numerous education and community initiatives, it is developing a Petaluma-based campus for medical device manufacturers and service providers, including the global sterilization company Synergy Health. Happ notes that Petaluma’s central Bay Area location enables Labcon convenient access to important regional markets. Proximity to the Port of Oakland has helped Labcon grow its global presence–an achievement recognized in 2011 when the company received the prestigious President’s “E” Award for U.S. Exporters, the highest recognition any U.S. entity may receive for making a significant contribution to the expansion of U.S. exports.